The visitors poured through the castle gates in a river of gold and silver and polished steel, three hundred strong, a pride of bannermen and knights, of sworn swords and freeriders. Over their heads a dozen golden banners whipped back and forth in the northern wind, emblazoned with the crowned stag of Baratheon. 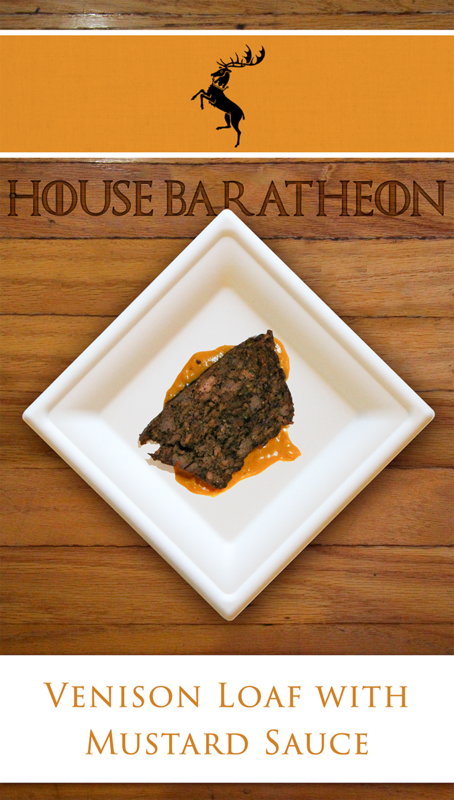 This venison dish was served as the Baratheon course for my Season 7 Game of Thrones party. Each of the nine courses was inspired by the heraldry of one of the Great Houses of Westeros. Game meats feature heavily in Westeros feasts, and Robert Baratheon was particularly fond of hunting, so it seemed fitting to represent the Baratheon crowned stag with venison. Even though deer roam wild around my neighborhood, the only venison my local grocer stocks is ground. For last year's Game of Thrones party, I incorporated ground venison into a Highgarden-themed venison stew, which was delicious. This year I decided to mix it up a bit, and make a meatloaf. Meatloaf can be a disappointing venture, sometimes turning out too dry or bland. Fortunately, J. Kenji Lopez-Alt has done some very thorough research on perfecting meatloaf so I started with that recipe. Because venison can be so lean, rather than replacing the beef with venison at a 1:1 ratio, I increased the quantity of pork slightly and increased the amount of gelatin. The texture turned out to be just about perfect. I contrasted the dark brown of the meatloaf with a golden mustard cream sauce. I wouldn't have immediately thought to pair mustard and venison together, however I'd tried the combination this summer at Le Square in Montreal and found it delicious. Serves 4-6 as a main course, or 10-11 as part of a tasting menu. 1 loaf of J. Kenji Lopez-Alt's "All American Meatloaf" recipe, with the following substitutions: (1) Replace the 1.25 lbs ground beef with 1 lb ground venison and an extra 0.25 lb ground pork. (2) Increase the amount of gelatin used by 0.25 oz to 0.75 oz (3 packets). (3) Use dark soy sauce in place of regular to darken the color of the meatloaf. (4) Skip the glaze. Make the meatloaf a few hours ahead of time and store in the fridge. While still cool, slice into an appropriate number of portions. Immediately before serving, heat a griddle or a large non-stick pan over medium heat. Reheat the slices by cooking briefly on each side. In a medium-sized saucepan, melt the butter over medium heat. Sauté the onions until translucent. Stir in the garlic and continue to cook for 2 minutes. Sprinkle the flour on top and stir quickly to combine with the juices in the pan. Deglaze with the brandy, then add the bouillon and bring to a boil. Remove from heat and stir in the mustard, Worchestershire sauce, soy sauce, pepper and cream. Taste for seasoning and add salt as necessary. Spread a dollop of sauce on each plate and top with a slice of venison meatloaf.